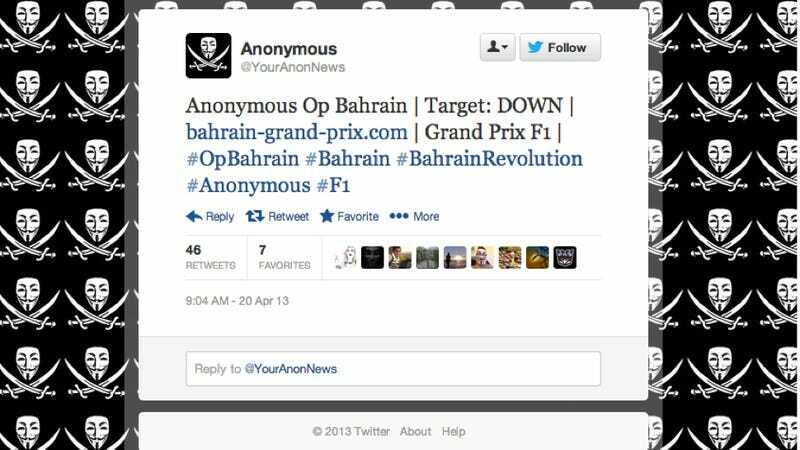 After threatening and threatening, "Hacktivist" collective Anonymous managed to take down the website of the Formula One Grand Prix in Bahrain this morning, albeit very briefly. Though I haven't seen a post-takedown official statement, it looks as if Anonymous is trying to bring attention to the political situation in Bahrain while the country is on the big stage, similar to other protests going on at the race. Previously, they said they would remove the F1 race from the Web and called the Grand Prix a "blood race." The GP website only appeared to be down for a few minutes this morning after the Twitter account most commonly associated with Anonymous posted about taking it down, most likely though a DDoS attack. DDoS attacks commonly work by directing large amounts of traffic to a particular site over a short time period. Given enough traffic, it can shut down a server that hosts a website. Bahrain authorities said they are ready to deal with attacks from infamous cyber terrorists Anonymous ahead of the Bahrain Grand Prix. The ‘hacktivists’ threatened to close down the Grands Prix internet service and those of associated sites. “We are aware of the new cyber threats and are ready to defend hacking attempts,” said an official from the Interior Ministry’s Cyber Crimes Unit. I wonder if Bernie Ecclestone would think this was stupid, too. Probably.